Simplify your invoicing with PayPal. Paperwork isn’t exactly the most glamorous part of owning a small business. Yet, sending out and tracking invoices is essential to making sure that you get paid promptly and that your clients are satisfied with your service. Sometimes, though, it can seem like you’re drowning in a sea of paperwork or spending extra time following up on unpaid invoices. With PayPal Invoicing, you can generate professional-looking invoices that are easy for you to create and track and easy for your clients to pay. 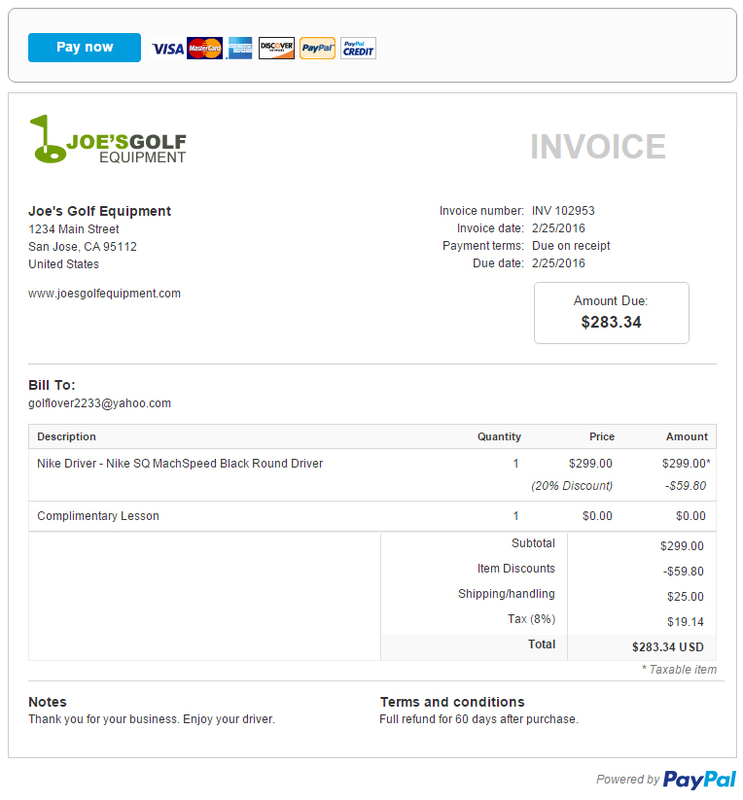 To illustrate how PayPal Invoicing can work for you, let’s look at Joe Harper, owner of Joe’s Golf Equipment. Joe opened his golf equipment store in 2009 with a tight budget, two employees, and big plans. In the ensuing years, his business has grown considerably, especially now that he also sells goods online. Lately, however, his trusty invoice book isn&apos;t cutting it. He’s finding it harder and harder to keep track of the invoices he’s sent, which ones have been paid, and when he received payment. He’s always enjoyed his experience with PayPal, so he decided to look into PayPal Invoicing to simplify his invoicing process. PayPal Invoicing turned out to be just what Joe was looking for: a fast, intuitive, and accurate tool that made organization a breeze. His company’s logo and information, including address and phone number. A note to his client. Joe can also create templates that can be reused over and over for future transactions. Or, for regular clients who frequently place repeat orders, he can copy and reuse existing invoices that carry over both the customer’s information and the items ordered so he doesn&apos;t have to enter them manually. Once he’s created an invoice, Joe has the option to send it to one person or add more people on the CC line – a spouse, business partner, etc. Group invoicing, billing multiple people for an event for instance, is also available. And if he needs to, Joe can add attachments, like terms of service, a document to sign, or an image. Once PayPal sends the invoice via email, the recipient can simply click the “Pay Now” button to make a secure payment either through a PayPal account or a credit or debit card (a PayPal account isn’t required). Once the customer has paid online, the money shows up in Joe’s PayPal account, usually within minutes. The client can also choose to pay cash or mail a check instead, and Joe can even opt to allow partial payments or a minimum amount. Once paid, the invoice will have a partially paid status until it’s been paid in full. Keeping track of those funds is a snap, too, because PayPal Invoicing lets Joe reconcile his invoices and payments automatically online. If he sees that he’s missing all of part of the amount owed by a customer, he can send an email reminder with a single click of his mouse. He can see a detailed history of his invoices, too, including due dates and a list of reminders he’s sent. And if the customer paid with a check, no problem – he can also use PayPal Invoicing to track payments made offline via cash or check. Joe can even create custom invoices on the go. With the PayPal Here mobile app, he can visit an office to offer his shoeshine services, for example, and generate invoices on the spot. Another bonus Joe appreciates is that PayPal Invoicing doesn’t cost an arm and a leg. There are no fees for creating and sending invoices, no setup charges, no monthly fees, and no cancellation charges. Rather, he only pays a fee when he receives a payment online. So, for each payment transaction with a customer, he pays a per-transaction fee of 30 cents plus a small percentage of the sale – 2.9%, which consistently makes selling online easy and clear. Best of all, though, is the time Joe has saved in sorting through spreadsheets and files and tracking his outstanding invoices. That means Joe has more time to manage his business, inventory his stock, and work to expand his company. Joe’s story shows how much you stand to gain from implementing PayPal Invoicing in your business. Any business owner will agree that time is money, and invoicing services from PayPal will save you a bundle. To get started on simplifying your business processes and taking back lost time, go to www.paypal.com/invoicing and see what PayPal Invoicing can do for you. Or, you can create one with our free Invoice Template Generator tool. How do I create my CSV batch PayPal invoice file? Here's how to create your CSV batch PayPal invoice file. Fill in the file, leaving the headers in place. Add one line per invoice recipient. Be sure to fill out at least the email address, item name and item amount. Refer to the currency codes page for PayPal to see all supported currencies. Save the file as a CSV file. Then click browse to select the file and upload. When you send a money request or invoice, you’re charged a small fee to receive the money. The fee is automatically deducted from the amount that you receive. Fees may occasionally change. To see the latest fees, click Fees at the bottom of the PayPal homepage. Discover how simple it is to get started. Create or download a free sales invoice template. Use our free sales invoice template to build a custom template for your business. In a few easy steps, you’ll create a professional template with your company’s logo and contact information. You can choose to bill by item or hourly and list the product or services you provided. You can even set up partial payments or give customers the option to tip. Create or download a free service invoice template. Whether you want to bill hourly or by flat amounts, provide the option to be tipped, or enable partial payments, you can customize this professional, free service invoice template to meet your needs.